Covering 10,528 hectares of mountainous landscape, the Buda Landscape-protection Area surrounds Budapest from the north-west, and at many points it deeply stretches into the city. The main objectives of the protection is to preserve the unique botanical, zoological and geological values of these wooded mountains and to keep the complex landscape of forests and open areas intact by preventing any constructions in the area. Our goal is to maintain this green belt in the vicinity of Budapest, which functions as the lung of the capital. This landscape shows a barren face from a distance, but a closer look reveals an extremely rich natural rock-garden. 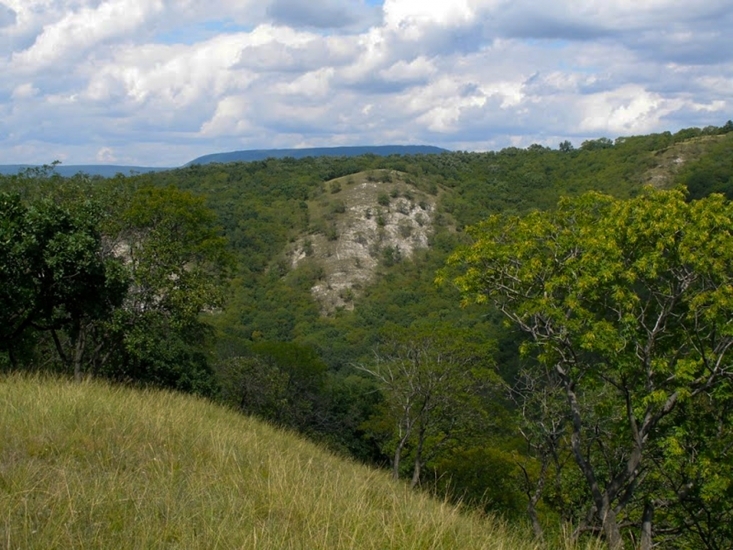 The main mass of its rock-bed is mid-Triassic dolomite, which is the oldest rock type in the Buda mountains. Its dry grassland consists of several species that grow only in the Carpathian basin, and some of them can be found only in these hills. In some cases even the names reveal the indigenous nature of the plants. This is apparent in names such as the Hungarian seseli, the Buda centaurea and the Buda sorb. The Amygdalus nana L. and the Phlomis tuberosa L., which grow in the grasslands in the loess soil at the foot of the mountains are also highly valuable. Outstanding zoological value of the area is attributed to the Coluber caspius, which is on the brink of extinction as a result of the disturbance caused by tourists. 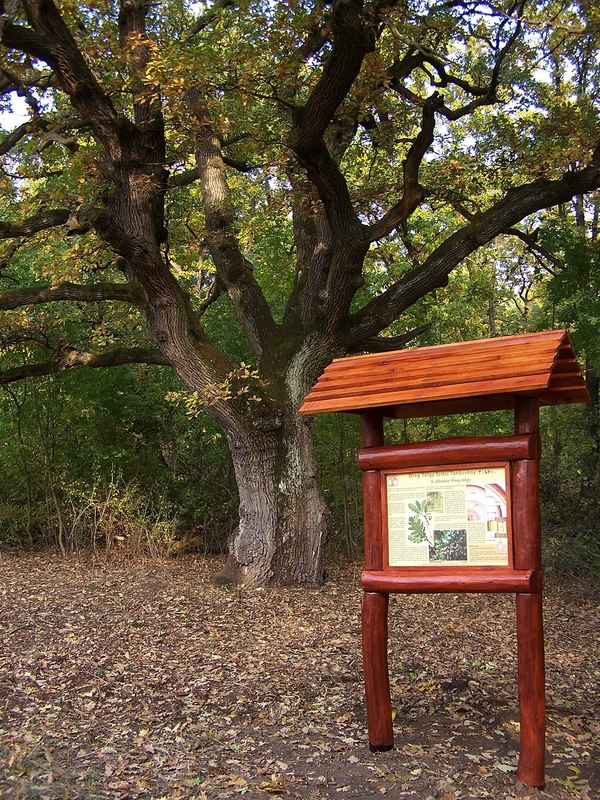 The area has been promoted by guide books since the late 19th century as the most frequented tourist destination within the reach of the capital, which includes János-hegy, the forest range of Budakeszi and the environs of Hárshegy. One of its most popular points is Normafa, a place popular with artists in the early 1900s. Its name refers to a giant beech which had witnessed a memorable performance of Norma’s aria by Mrs. Schodel, a celebrated diva of the age. 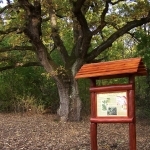 The tree was later struck by lightning but lived on until 1927.The 160-180 year-old beech and sessile oak forests on János-hegy offer a chance of survival to several species which live in very old or dead trees. Today, in these forests, the warbling of the black woodpecker, which nests in the hollows of old beech trees, can often be heard. The first early spring flower in the Buda hills, the winter aconite blossoms in the hornbeam-oak forests. 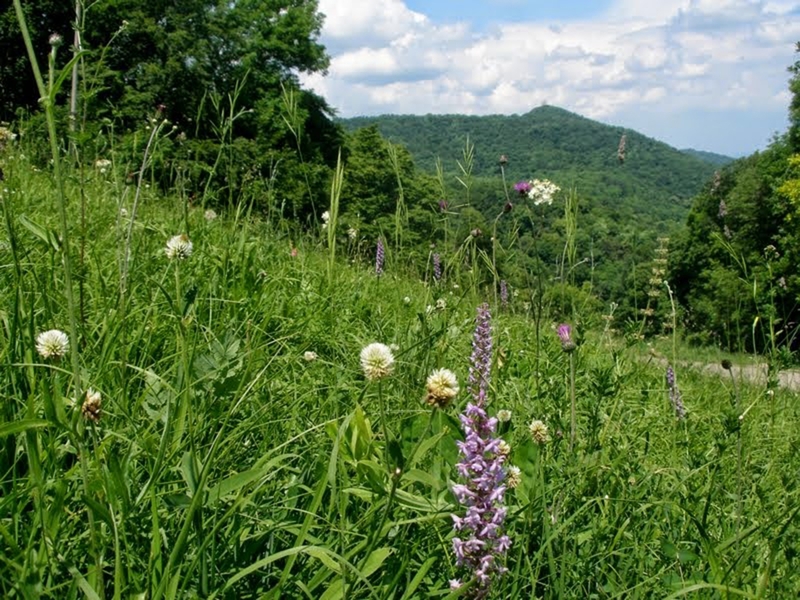 The steep dolomite edges of the mountain chain which extends from Hármashatár-hegy to Kálvária-hegy in Solymár feature rock vegetation dotted by the Lagurus ovatus, an indigenous plant of Buda, whose beautiful dark blue flower resembles the tail of a rabbit. Red viper's buglosses decorate the steppe slopes of the mountain. In places where woody plants can cling to the soil, the grassland is replaced by sumac dotted karst-bushes and then by hornbeam-oak woods. Along Hármashatár-hegy, the edible domestic sorb, Pyrus nivalis and the Vitis sylvestris, which grows clinging to trees, are reminiscences of a viticulture that once flourished here. The barren dolomite rocks also provide a peaceful habitat for the protected black Sorbus aucuparia and also the Spiraea media, which grows only here. Some rare orchids, such as the fly orchid, the Ophrys scopolax CAV subsp. cornuta and the Himantoglossum caprinum are also found in these mountains. 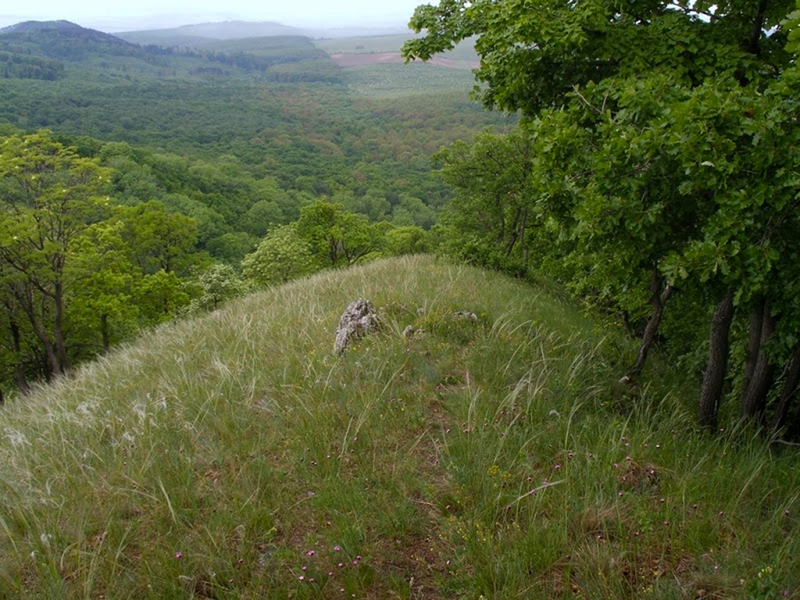 The rock grasslands and karst bushes on dry and warm southern hillsides provide an ideal environment for the most valuable insects of Mediterranean and continental origin, such as the slowly moving Saga pedo, largest insect in Hungary and in Europe, and the Aculaphus macaronius, an insect characterised by astounding looks and very high flying speed. The most interesting vertebral animal is the Ablepharus kitaibelii fitzingeri, which lives on the barren limestone and dolomite. The thick-bench character of the rocks can be observed in the side of Remete-szurdok, a ravine which cuts into the pure white Dachstein limestone of the hill. Research has unearthed unique archaeological and palaeontologic finds in the caves of the ravine. The Remete cave yielded the remains of the bones of ancient species such as ptarmigans, cave-lions, cave-bears and cave-hyenas. The protected plants of Remete-hegy are the Anthericum liliago, the Hungarian peavine and the Sternbergia colchiciflora, which blossoms in autumn. These hills have a unique nature protection value recognised by the European Council. The area was awarded the Europe Diploma in 1995. Triassic dolomite is the material of their undulating surface, which is divided by mountain ridges and valleys, where wet and dry oakwoods, karst bushes, steppe slopes and rock grasslands grow in a mosaic pattern. Only a few meters separate the dry and warm micro-climate of the southern slopes from the cold northern sides, and the large climatic differences have yielded completely separated and individual vegetations. The species that adjusted to either climate and survived here have become independent indigenous species, being isolated from other related varieties. The most famous of these is the flax of Pilis (Linum dolomiticum), which grows only here in the whole world, and its closest relatives can be found only as far as the snowy region of the Olympus. 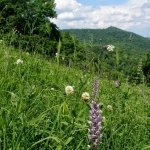 There are almost 50 protected plant species in the area, a large number of which grow only on dolomite and only in Hungary. 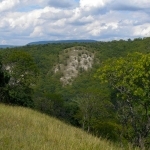 The 559-meter-high peak of Nagykopasz is the highest point in the Buda hills. The surface, which consists mainly of limestone, is here replaced by dolomite hills divided by undulating valleys and ridges. This is where the Daphne cneorum L., a fragrant dwarf shrub lives, which has been present in Fekete-hegyek and Meszes-hegy since the ice-age. The Z+ tourist path is accessible from the terminal of bus no. 65. Walking along the path that winds on the north-eastern hillsides, you will be surrounded by steep dolomite ridges and enclosed dolomite rock grasslands featuring the magic blue of the Lagurus ovatus. From the resting area called Nelli, a beautiful view of Óbuda opens up, and in clear weather even Naszály-hegy, in the neighbourhood of the town of Vác, can be seen from here. Leaving Virágos-nyereg proceed to Guckler Károly sétány, a promenade named after a head-keeper in Buda in the early years of the last century who established several tourist paths on the mountain. From there follow the path marked with S, and descend to Alsó-Jegenyvölgy. In the valley of Paprikás-patak two snow-white dolomite rocks can be seen, and then, passing the Rózsika spring, you will see the ruins of an old swimming pool hit by a bomb in the Second World War.